The 12,000 km journey from eastern England to eastern China will take three weeks, around half the time needed for the equivalent journey by boat. The first freight train from China arrived in the UK in January. The bright red train left a depot at Stanford-Le-Hope in Essex for Barking in east London, hauling dozens of containers. From Barking, it will pass through the Channel Tunnel into France and on to Belgium, Germany, Poland, Belarus, Russia and Kazakhstan before ending up in Yiwu in China. Britain is trying to enhance its trade links with the rest of the world as it prepares to leave the EU in two years time. Run by Yiwu Timex Industrial Investment, the Yiwu-London freight service makes London the 15th European city to have a direct rail link with China after the 2013 unveiling of the “One Belt, One Road” initiative by Chinese President Xi Jinping. 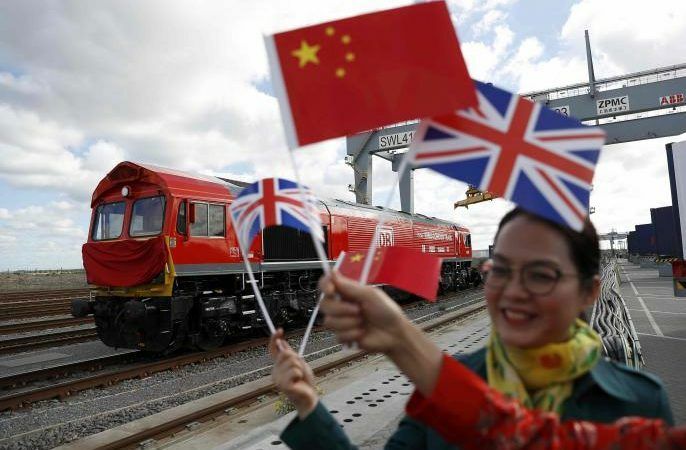 “This is the first export train and just the start of a regular direct service between the UK and China,” said Xubin Feng, chairman of Yiwu Timex Industrial Investment Co.